In this tutorial I’m going to explain a couple of ways you can use to install Lightroom Presets to your computer. Whilst I’m using a Mac computer for this, the process is the same on a Windows PC. I’m also using the 2018 version of Lightroom Classic CC. If you’re using an older version of Lightroom there may be some minor differences, but I will try to highlight these. Importantly, some people will experience issues installing Presets using the second method. Later in the tutorial I’m going to explain why and what you can do about it. This is possibly the easiest way to import your Lightroom Presets. It’s less flexible than second method outlined later. But it’s guaranteed to work whichever version of Lightroom you’re using. If you’re using an older version of Lightroom (not Lightroom Classic CC 2018) your screen may look a little different to the images shown. Don’t worry, there’s a special note for you at the end of the description. If you haven’t done so already, open Lightroom and switch to the Develop Module. The Lightroom Presets panel is on the left-hand side of the interface. At the top right of the Presets panel, you will see a ‘+’ icon. Click the ‘+’ icon to display a small popup menu. You can see an example in the screenshot below. In the popup menu, select the Import Presets option. This displays a file dialog where you can select the Preset or Presets that you want to import. You can select multiple Presets in this dialog by holding down the shift key whilst clicking on the first and last Preset in the list. When the import completes, you will see a new folder appear in the Presets panel called “User Presets”. This folder contains all the new Presets. You can rename this folder to something more meaningful by right clicking it with your mouse. This displays a popup menu as shown below. When you click the Rename option in the menu, Lightroom displays the Rename Group dialog. Here you can enter the new name for the Preset group, then click OK. This might be the first time you’ve imported presets to this copy of Lightroom. The folder may have been deleted. You may have renamed the folder. In all cases, Lightroom will create a new User Presets folder to receive the newly imported Presets. If you’re using an older version of Lightroom, it’s possible you won’t see the ‘+’ icon at the top right of the panel. Instead, you can right-click on the existing Preset folders in the Preset panel to display a popup menu. Here you will see the option to “Import…”, which will import Presets to the folder you right-clicked. The process is the same as described above. Alternatively, you can select “New Group”. This will create a new folder in the Preset list, after which you can import presets to it by right clicking. If you want to know more about managing and organising your Presets this article will help you. The second method to install Presets in Lightroom is a little more technical and slightly messy. This used to be the way most preset suppliers recommended, but an increasing number of people will find it doesn’t work. I’ll explain why and what to do about it later. First though, let’s cover how to do the installation. To install Presets using this method you need to locate the Lightroom Preset folder on your computer. Fortunately, this is easy to do as Lightroom provides a handy button. You can access this in the Lightroom Preferences dialog. To open the Lightroom Preferences select “Preferences” from the “Lightroom” menu. If you’re using a Windows PC, you will find the “Preferences…” option in the “Edit” menu. When the Preferences dialog displays, click the “Presets” tab. You can see the dialog in the screenshot below. Here you can see the “Show Lightroom Presets Folder…” button. Click the button to open a Finder file window on a Mac or Explorer window on a PC. This will open to show the “Lightroom” folder which is where you will find the “Develop Presets” folder. You can see an example of this below. 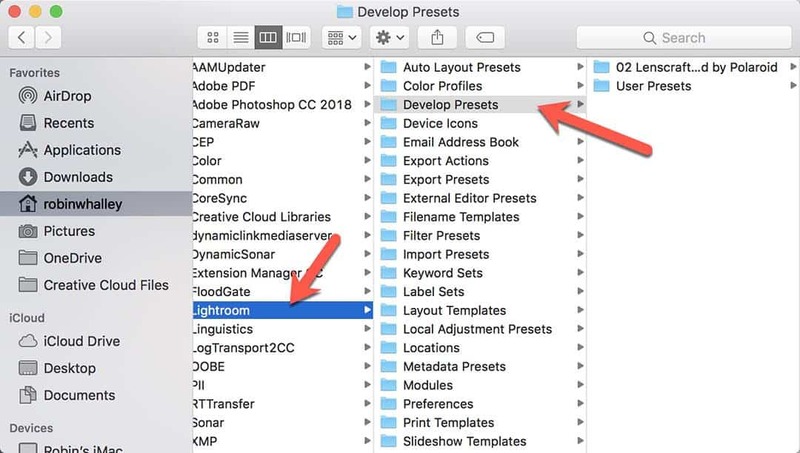 Now you can copy your folder or folders containing your Presets into the Develop Presets folder. You can see above I’ve copied the folder “02 Lenscraft Inspired by Polaroid” which contains some of my Presets into this location. The final step is to restart Lightroom. Until you do this your new Presets won’t be visible in the Lightroom Presets panel. It’s quite possible that even if you follow steps above, your new Presets still aren’t visible in the Presets panel. If they aren’t, it’s most likely because of the following. In April 2018 Adobe released a new version of Lightroom CC (2018). In that release they changed the format of the Lightroom Preset from “lrpreset” files to something called “xmp”. Both are really text files, and both contain information about the settings to apply for the Preset. As a result, Lightroom no longer supports the lrpreset format. When you copy “lrpreset” files manually into the folder, Lightroom doesn’t recognise them and so can’t display the Preset. When we use the first method described above to install our Presets it automatically converts the Preset to the new “xmp” format. We don’t need to worry about files being in the old format. Unfortunately, what’s further complicated the situation is that Adobe moved the location where it stores Develop Presets. They are no longer in the “Develop Presets” folder. Instead they’re in a very different location, the “Adobe\CameraRAW\Settings” folder. Here’s what it looks like on my Windows PC. Now I’m not going to go into detail about where to find this folder. You can easily find it if you want to by right clicking a Preset in the Lightroom Presets panel. This displays a popup menu where you can select the option to “Show in Finder” or “Show in Explorer”. But even when you know the location and your Presets are in the new XMP format, I currently don’t recommend copying your Presets there. That’s because you don’t have full control over the folders and files in this location. If you copy in a new folder with Presets manually, Lightroom still won’t recognise them. That’s because it uses a new index data file to keep track of the Presets. When you import presets as in method 1 above, they are added to the index. But when you manually copy the files aren’t and Lightroom doesn’t see the new Presets. Rather than manually editing index files I recommend you install your Presets with the Import feature described in Method 1. The entire approach to installing Lightroom Presets is now a bit of a mess in my opinion. I understand why Adobe wanted to move to the new format for Presets, but I don’t think they spent enough time thinking it through from the user’s perspective. In this tutorial I’ve presented two methods you can use to install Lightroom Presets. If you’re using a version prior to Lightroom 7.3 you can use either method. If you’re using Lightroom 7.3 or later, I recommend you use only method 1. I hope you’ve found this information helpful. I think more and more people will run into this problem as they move to the newer versions of Lightroom. If you hear of anyone struggling, please share this article. You might also like this article I created to provide an introduction to Lightroom Presets. 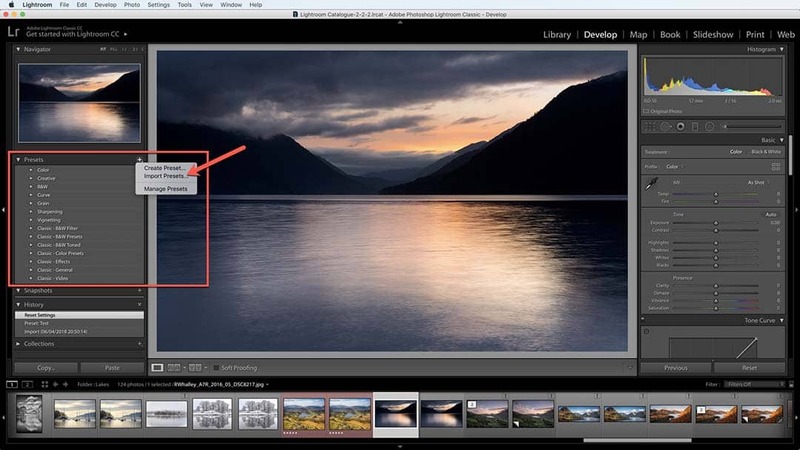 Improve your skills and knowledge of the Lightroom Develop module with my book. Visit my Adobe Lightroom Tutorials page to browse through all the Lightroom tutorials on Lenscraft. If you still can’t find what you’re looking for, get in touch to make a request. I assume you wrote the paper with Classic LR v 7.3 in front of you. I don’t have that version any longer, instead I look at v 7.5. In this version there are two buttons on the ‘Location’ block in Preferences\Presets tab. 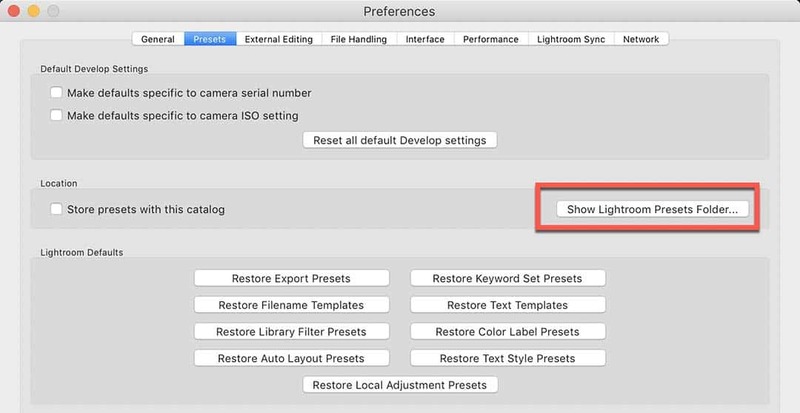 The first (‘Show Lightroom Develop Presets’) points to …\CameraRaw\Settings (the new presets location-common with ACR), the second (‘Show All Other Lightroom Presets’) points to …\Lightroom\Development Presets (the old presets location). ‘Method 1’ you recommend in your paper only works for presets written in the new format, with .xmp extension. It does not automatically convert the older format. Presets using the old format and .lrtemplate extension must be copied into …\Lightroom\Development Presets folder, and then LR has to be restarted. Restarting LR automatically converts older presets found in the old location to the new format, copies them to the new location and adds ‘~~’ prefix to the name of the old preset file, leaving it where it is (in the old location). I used v7.5 for the article and video. The reason you don’t see the second button is because that’s only seen in the Windows version of Lightroom. I do mention it later but you probably missed it. I don’t have any problem using Method 1 with the old format presets. It still works in my version 7.5 on both Windows and Mac computers. I just double checked it and when I import the old format files they are converted to the new format and copied to the directory mentioned in the video. It’s working just as I described on all my computers. It’s very odd that you’re seeing a deifferent result. I played with it some more and came to the conclusion that it depends on the specific presets you try to import. For most cases, your recommendation works OK.
That’s good. Thanks for letting me know.